Your answer may or may not be the same from when you were young, but the question has probably prompted lots of daydreams about that perfect future job. However, it may be difficult to begin thinking about how to make your dream job a reality if you’re trying to figure out how to pay for college. According to Pay4CollegeArizona, college graduates make an average of $1,000,000 more over their lifetimes than high school graduates. That’s a strong incentive to find a a way to afford college tuition so you can achieve your dream. That’s why we’ve highlighted some steps that all Arizona residents can take to make college affordable. The first step you should take, and one of the most important steps, is to complete the FAFSA, also known as the Free Application for Federal Student Aid. This is a free application to apply for need-based federal funding. You can (and should) complete this form as early as possible because the FAFSA opens up other financial aid resources—such as scholarships and grants—which are distributed based on this form. However, the FAFSA is popularly known for being a very confusing and lengthy application. But trust us, it’s worth it. The federal government gives over $150 billion to students across the nation to help pay for college. And not to worry, our step-by-step guide to completing the FAFSA questions will help you through the FAFSA more quickly and easily. We’ll take you through each question to help you fill out the form with fewer headaches. When looking for state resources available to Arizona students, it’s best to start at the website for the Arizona Commission for Postsecondary Education. Unfortunately, financial resources offered directly from the state are limited. But don’t be discouraged, you can still look at the scholarships and grants provided by the Arizona Community Foundation. They award millions of dollars in scholarships and grants to Arizona students. There are also some grants that are offered to Arizona residents. While there aren’t many state scholarships and grants that are specific to Arizona, there are many institutions in Arizona that are committed to making college affordable for students. Let’s look at Arizona State University’s financial aid resources. Arizona State has a scholarship for students who want to make a difference in the world and are also academically distinguished. This program is called the New American University Scholar program. Similarly, Northern Arizona University (NAU) also has financial aid resources through their foundation, known as the NAU Foundation. Here, you can find all the scholarships clearly laid out in different subject categories. Further, at the University of Arizona, Tucson, over 85% of undergraduates receive some sort of financial aid, and merit-based scholarships are even more generous. Take for example the Wildcat Excellence Tuition Award, which gives students up to $12,000 in aid. The University of Arizona also manages the website Scholarship Universe, which can help you find scholarships to the University of Arizona as well as external scholarships. Even if you don’t plan on applying to any of these schools, going on to the financial aid websites of these institutions and others can be a very useful tool to finding scholarships and grants to help pay for your tuition. It’s not uncommon for students to still need more funding even after applying for the FAFSA and other types of financial aid. If you’re in that situation, you might want to consider taking out a private student loan to cover the rest of your tuition. 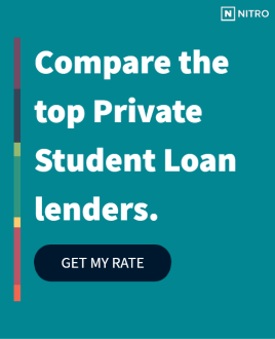 We know that it’s essential for you get the best loan possible, which is why we have listed the best banks for private student loans. You can also use our NitroScore Tool which will give you an idea of approximately how long it will take you to pay back your loans based on your college or university, your savings, and your financial aid. Using NitroScore can be very helpful for understanding your finances before you make the huge step of paying for school! We know that this is a lot to process, but you are one step closer to living your dream.